Sell-side analysts and investors are, as they should, scouring to find the next Apple Computer. In order to help the process along, we ran our proprietary software, with a few popular metrics capsulized in the table below. 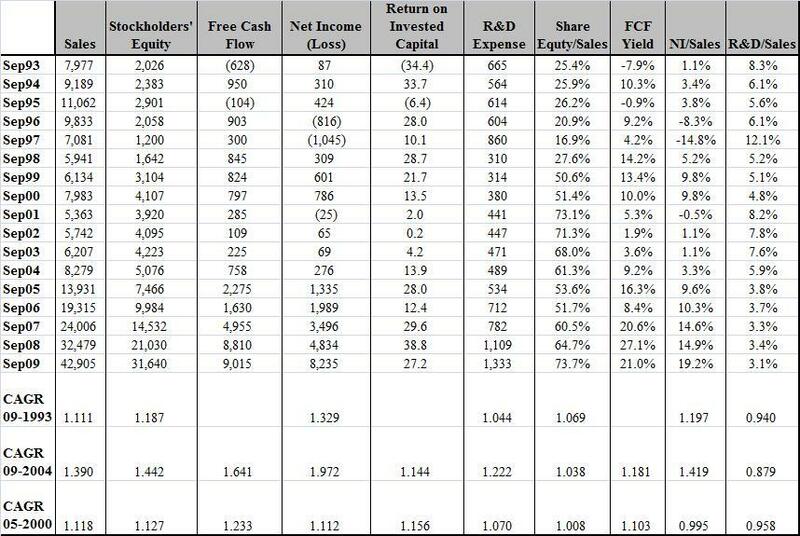 What is surprising from the table below is that investors had quite a few years to buy stock in Apple when it was between $50-$100 per share, for at that time the company was already showing a powerful rate of growth, and the ability to produce superior free cash flow and return on its invested capital. Over the ensuing five years, Apple has been able to reduce its risk parameters, which we measure as its cost of equity capital, and which we will delve into in additional blogs in the weeks ahead. As the table shows, for the period 1997-2009, Apple showed a compounded rate of sales growth of 11.8% per year very similar to its growth rate in sales between 2000 and 2005. In addition to the metrics in the table, we reviewed at least 60 other fundamental metrics, from tax rate, cost of sales, and other financial stability variables, to R&D efficiency, patents, pensions and other post-retirement, purchase agreements, commitments, litigation risk, use of cash, growth in certain metrics compared to others, etc. We believe we have the most comprehensive fundamental database that exists! Let me say, before I go further, I have not found the next Apple Computer, if indeed there is one out there. The closest company in all metrics was Google, but picking Google is no fun, besides being within 20% of fair valuation. From the initial screens, firms dropped out for many reasons, some financial, some credit, many “other,” such as pending litigation. Some firms were buying back stock, which Apple does not, and which we have long felt is a waste of shareholder cash. Share buybacks do nothing to enhance shareholder value and certainly nothing to improve return on invested capital (ROIC). With that said, what investor would be against a double, which we believe our recommendation offers. Open Text (OTEX) develops and supports enterprise software specializing in Enterprise Content Management (ECM) solutions. It has strategic alliances with SAP AG, Microsoft Corporation, and Oracle Corporation. They have the second leading market share in its field at 18%, versus IBM’s 22%. ECM is essentially software that manages everything from invoices, mail spreadsheets and any other business content important to the firm. Open Text brings forth a best practices approach, combining features of the leading software vendors such as IBM’s Office, with those of Oracle, and SAP. The partner represents 10% of OTEX license revenue as their biggest partner. OTEX has a diversified global and customer base of leading industrial, government and financial firms. Sales are 53% North America, 39% Europe and 8% Asia and other. The recent fall-off in OTEX shares is creating good value for investors. Its shares, having reached $50 in May, due to a disappointing quarter from Europe and Asia, is now trading at $38. Over the past 5 years, revenues have risen by a compounded rate of 21.9% and free cash flow by 39% per year, a rate which is now obviously slowing considerably, but, whose long term growth approximates that of Apple. Recall Apple sputtered in quite a few periods itself. OTEX is seeing bigger swings in its quarterly GAAP results due, in part, to recent acquisitions making seasonality more pronounced. Such swings are being created by governmental expenditures, a large customer of recent quarters resulting from the most recent acquisitions. Even though earnings are showing greater inconsistency, free cash flows are remaining strong. In fact, the firm has stepped-up hiring in Canada, where business remains robust. With a market value of $2.1 billion, Open Text currently sells at 11.4 x free cash flow versus 16.5 x for the S&P Industrials; 15% of its current market value is in cash which will see a significant build, ex acquisitions, over the coming years. 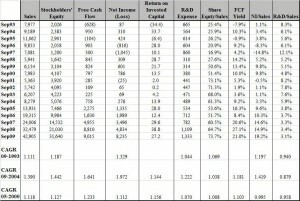 Over the past three years its operating cash flows adjusted for balance sheet changes are roughly similar to its operating cash flows-this signals the management has not been engineering its balance sheet to raise cash, which is what one would expect with a strong, consistent producer of free cash flows like OTEX. Of equal importance is OTEX’s return on invested capital (ROIC) of 18.5% compared to its cost of equity capital of 9.1%, below that of the median S&P cost of capital of 9.2%. Cost of capital has risen of late due to greater volatility in its financial results. By comparison, EMC’s ROIC is 15.6%. The firm has shown a positive spread over its cost of capital in each year but one year since 2002, but still produced free cash flow in that year. The firm is very much a value creating entity, in good part from well-priced acquisitions. In this regard, management has stated it will be utilizing its upcoming free cash flows for acquisitions rather than buybacks. Acquisitions are small and thus have greater chance for success as integration and financial risk are reduced. OTEX has benefited from a very low cash tax rate versus an effective rate, from large loss carryforwards (many from acquisitions) for which it is only allowed to utilize the credits over time. It has large foreign loss carryforwards. Of the total, $26 MM is domestic and $406 MM foreign. Expiration is not a concern. Its most significant tax jurisdictions are Canada, the US and Germany. Cash taxes should remain low for the coming five years, at which point the economy should hopefully bring up the most recent growth rate. In just two of its past six years, has OTEX paid greater than $7MM in taxes. Although not debt free like Apple, owing to its acquisition program, its fixed charges, including that related to pension are easily serviceable from operating cash flows, including debt reduction from free cash flows. Its discount rate related to its pension is, at 6%, is high but, as adjusted, adds little to overall liabilities. The fund is underfunded by $14.8 MM . Its annual service and interest cost is less than $1MM. OPEX has a 7 year term loan at LIBOR plus 2.5%, expiring in 2013 which they should have no trouble, given current conditions, extending. They are also employing a derivatives’ strategy as an interest rate collar having a $100MM notional value. Collection period and days payables outstanding reflect a healthy concern. OTEX uses a limited cash flow hedge for foreign currency. Given normalized 10% long-term growth, and 18x multiple, which would be conservative given its consistency measures, its weighted average and equity cost of capital, and 3% inflation, fair value is estimated to be in the low $80’s, a price which we feel should be realized within the coming three years. OTEX has risk and should not wish to be considered by certain investors-consult your investment professional. Investors and potential investors should not rely on any information contained herein or communicated by any means to replace consultations with qualified investment professionals to meet their individual investment needs. The materials contained herein are for general purposes only. They do not have regard to the specific investment objectives, financial situation or risk tolerance of individual or corporate investors. Investors should consult with a financial professional prior to making any investment decision or investing in any of the firm’s products. CT Capital LLC, it employees, or any associated individual, is not responsible for any investment decisions the recipient of these materials may make with respect to any investment. Data contained herein is gathered from sources believed to be correct and reliable but assume no liability for the accuracy or validity of any material whether written or verbally communicated. Nothing in this presentation should be construed as an offer to sell, a solicitation of an offer to buy, or a recommendation for any security or investment by CT Capital LLC, its directors, officers, principals, employees, agent, affiliates, or any third party. No employees or clients of CT Capital LLC or www.credittrends.com own a position in OTEX., nor was CT Capital or credittrends paid for preparing this report.